I am about to help with nightly homework with Mary and realized that I forgot to blog today! I really like writing you, but between my son's emergency tooth appointment and a host of other cares, including cutting my notes down for a speaking engagement I have tomorrow—I somehow, forgot! I was going to give you one of my favorite prayers today that you could print out and pray it as you have your coffee, or when you first get up! I love it, and learned it from Elisabeth Elliot. I'll give it to you tomorrow. The church where I am speaking tomorrow asked me for an updated bio. I thought you might like to see it—especially because you are in it!! Born & raised in one house my whole life in Richmond, Virginia, I enjoyed going to school with a lot of the same people for twelve years! I was raised up in a Baptist church that we walked to behind my house. I moved to NC to attend Meredith College. In the next ten years I did drama, singing, graduated, became a sales representative for Xerox Corporation, became a National Account Manager, gave corporate speaking presentations, married my college sweetheart, separated, became a Christian, reconciled, began Bible study & helped in youth ministry. 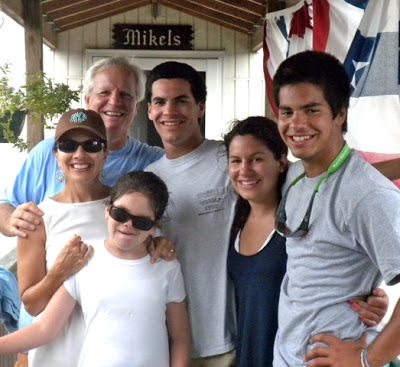 We later had four children—the youngest of which was born totally blind. I believe everything I learned in my life to that point—from my childhood including the sadness of parental strife & alcoholism—to college—to working for Xerox—to falling in love—to meeting with the Governor—to singing—to getting married—to drama—to our reconciliation—to becoming a Christian—to Bible study—to youth ministry—was so that I could teach my children the ways of God. I left for a friend's out-of-town wedding, and I use to know the other 2 things that warranted my leaving my precious family—but I can't remember now, and would have to look them up in my journal. I well remember I didn't even leave when Elisabeth Elliot invited me to go to an invitation only event in Oklahoma where she was the speaker—against the advice of close friends that I admired. My husband and I didn't feel I needed to go much as I would have loved being with her—because I was 100% committed to being home when I had young children, I didn't even struggle with all the other choices for my time. E. Elliot told me she totally understood, I'll blog that note soon). I began writing the night of my conversion in my own blank page journals, and I made a little handwritten book for each child of things they said to me until they each were about 5 or 6. I couldn't read a ton of books aloud to them snuggled countless hours in a cozy chair, nor write down all the darling things they said in our "conversations"—if I had not been there, nearly every hour of every day. That's why I left a 6 figure job to be with them. That's why I didn't lead Bible studies. You can see now why I want to write to help moms. You can't come back later and be a "Mommy,"—they'll be all grown up. Time is God's way of everything not happening all at once. There is a season for everything. I always wanted to teach Bible study with women but was unable to do so because of the decision to teach our children at home. While no accomplishment will ever surpass the time spent at home with my children, I was always a little sad that I could not also teach women about Christ other than speaking about one time per year to honor my commitment to truly be a stay-at-home-mother with my children. In 1992, I was befriended by author and speaker Elisabeth Elliot after being a listener to her radio program. 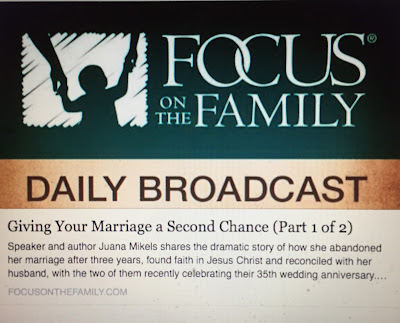 I appeared on her program, after which she suggested that I write 3 books: one on our marriage testimony, one on family life, and one on order. 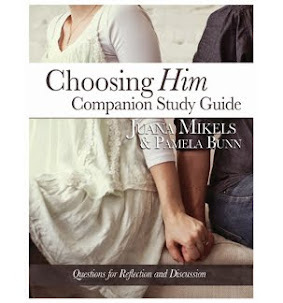 Ten years later, I wrote the 1st two books, she suggested and added a 3rd one on seeing God’s heart in your special needs child—for by that time I had had my fourth child. She later came to my home several times. 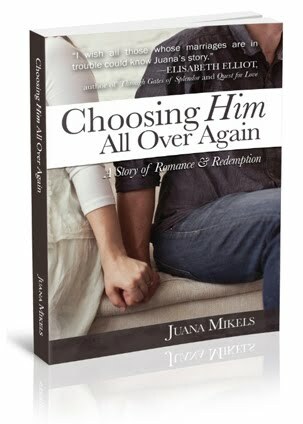 The first manuscript is entitled Choosing Him: Choosing my Husband All Over Again and is about my becoming a Christian—written to offer hope to women who are struggling in their marriages—with the forward by you guessed it—Elisabeth Elliot. I was blessed to get a literary agent, Blythe Daniel, when after 8 weeks of rejection letters, I suddenly had three agents interested (all three were Christians). I selected Blythe because of her wonderful reputation and experience in publishing and because she believes in the message of the book. She is currently seeking a publisher. At the suggestion of a friend, I wrote my first blog in August of 2009—(the only one I managed to write that year) and was not really sure what a blog was or who in the world would want to read it! I tried it again in 2010, with more regularity and and created a website. My website has had over 30,000 page views mainly from the United States—but they're from all over the world! My blog has been read by women in nearly twenty countries. 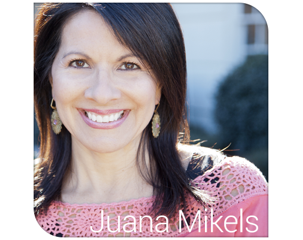 God answered my prayer to be a spiritual leader to other women—only He answered it in the most creative way I would never have dreamed of! He even continues to throw in a few good young men that think of me as a spiritual mother. What a privilege to gain sons, daughters, sisters and brothers to encourage to keep seeking Christ! I loved reading this and I LOVE LOVE LOVE Elizabeth Elliot! She's my all time favorite author!!! I met her in 1993 when she came and spoke to our dorm floor at Moody Bible - it's one of my highlights of my college years! Thanks for sharing your story here! Keep writing!